Sunday was the first day of the season in Leighton Buzzard Railway’s centenary year. 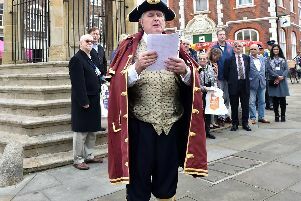 After the traditional shout from town crier Peter Hailes, the first train was flagged away by the Mayor of Leighton-Linslade Clive Palmer, accompanied by the Mayoress. More passengers than expected made sure that all trains on the day were filled almost to capacity. The day's trains were hauled by Pedemoura, an Orenstein & Koppel steam engine which returned to England after spending its working life hauling coal trains in the Douro Valley, Portugal, and only came back into full traffic last year after a complete restoration. A special Mother's Day this coming Sunday will have two steam trains leaving Page's park hourly from 10:30 until 15:30. Mums will get a small present and a free family photograph on the platform or in the train. Cream teas will be available in the Buzzrail Café. The line was opened in 1919 to move sand from the quarries on the edge of town to the processing plant and exchange sidings on the main line railway, taking away heavy traffic which had been causing a lot of damage to the town's roads. Much of the track and equipment used was war surplus material from the First World War. The Leighton Buzzard Narrow-Gauge Railway Society started working with the owners in 1968, taking over the line when commercial use ended, and now operating it as a Heritage Railway and museum.